Raise your glass to celebrate our 10th annual IU Health North Hospital Art of Wine, a can’t-miss event in the Carmel Arts & Design District. Saturday, July 21 from 5 - 10 p.m. 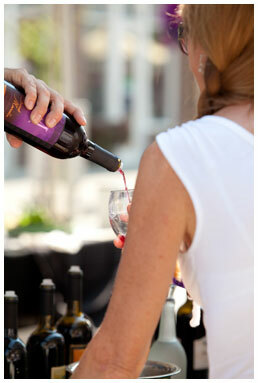 Adults 21 years of age and older are invited to unlimited wine tastings from participating wineries for only $20. All ages are welcome to attend IU Health North Hospital Art of Wine, enjoy the entertainment, take in unique art and visit the District’s shops and restaurants. There is NO admission cost to any of our festivals or events. Photo identification will be required for all guests who wish to participate in the tasting. 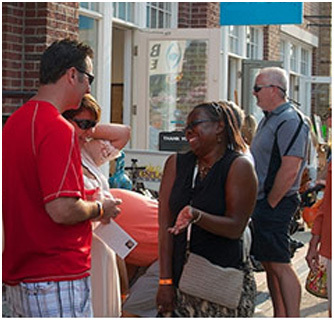 Many of the Carmel Arts & Design District boutiques and merchants will host special sales or promotions during the festival. 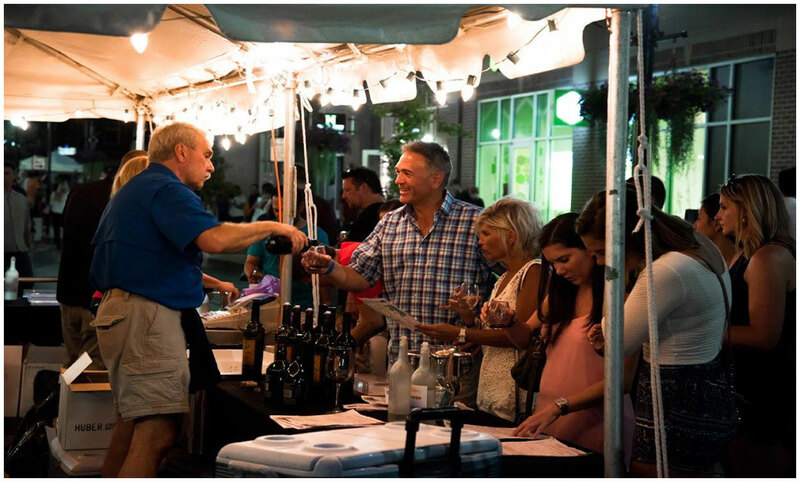 All ages can enjoy the District’s galleries, shops, restaurants and entertainment at Art of Wine. Cash and credit cards will be accepted to purchase the $20 tasting glass. 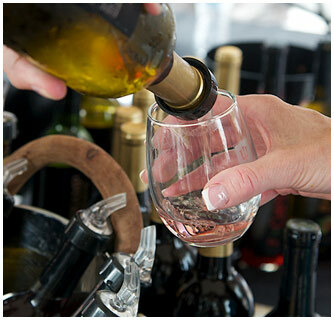 If you wish to purchase by the glass or bottle from your favorite winery’s booth, instead of tasting, you can do that! - Main Street and 3rd Ave S.W. Please enjoy and act responsibly. With that in mind, we have convenient Uber and/or Lyft pick-up locations immediately outside the festival area. From the independent music mecca, Athens, GA, Family and Friends will captivate you with their alternative-Indie energy. Having just released their newest album “Felix Culpa” June 8th, Family and Friends continue to amplify their “good music, good people” mantra. With an upbeat, enthusiastic charm, their newest album explores the complications of life. Hot off the famed 3-day Athfest and having played at events that music-lovers flock to like “Summer Camp Fest,” they know how to connect with the audience and electrify the crowd with their rejuvenating sound. If you like Mumford & Sons and The Lumineers, you will love Family and Friends. 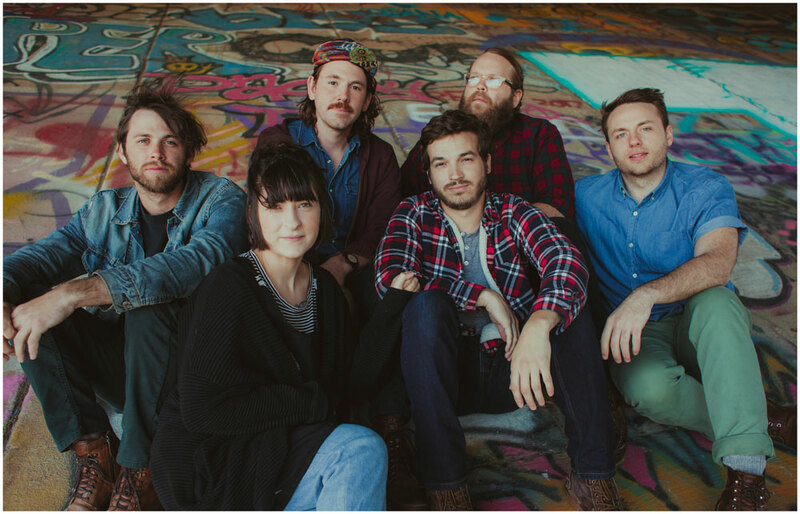 Their national touring schedule has opened the door for them to share the stage with Oh Hellos and Judah & the Lion. Art of Wine is a great opportunity to catch a live show before they kick off their “Felix Culpa” tour this fall. Their devoted fan base pushed their popularity on Spotify to over 16,000 listens with their latest single “Amadeus.” Both on and off stage Family and Friends’ connection with each other and their fans reveals their eclectic whimsy and general fun-loving nature. Art of Wine is thrilled to host this up-and-coming band right before they headline at the BraggJam Community Festival and Concert Crawl in Macon, GA. The genuinely welcoming chemistry between Mike, Casey, Tuna, Ryan, Alejandro, and JP is undeniably refreshing. For more insight into the band check out their interview at abeerwiththeband.com. Family and Friends will appear on the main stage at 8:00 p.m. on South Range Line Road. At Indiana Artisan, Peacetree Mountain Truffles will be sampling and selling small packs of delicious truffles. You may also sample and buy both Tell City Pretzels and Amazing Potato Chips. Stop by Tina’s Traditional Old English Kitchen & Tea Room to purchase their delicious scones, cornish pastries, sausage rolls, slices of cake, and refreshing iced tea. Want to take home a free souvenir to remember Art of Wine? Get your caricature done! Be sure to stop by Custom Eyes Designs next to the leasing office of Old Town on the Monon Apartments, from 6-9 p.m.
Visit Indiana Artisan to purchase witty wine-themed photo prints. In honor of the 10th anniversary of Art of Wine, we are giving away music from some of the guests we’ve welcomed to the event over the years! Reply to The Carmel Arts & Design District’s twitter with #vinyl or #CD (to let us know which you prefer to get) and your zip code for a chance to win music from either Judah & the Lion or St. Paul & the Broken Bones! Winners will be notified on Thursday, July 26, 2018. Enter to win two bottles of 2014 Cabernet Sauvignon from Andretti Winery at any of our four point of purchase tasting glass locations! Must be 21 years or older to win. Special thanks to The Michael Andretti Foundation for partnering with us for this give away! Create your own work of art to take home! Wine & Canvas will be at our event. 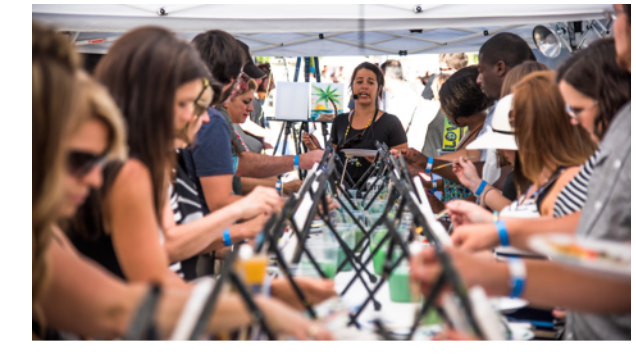 Their instructors guide you step-by-step to create a painting masterpiece of your own! Stop by the Indiana Artisan on Main Street to browse art from all over Indiana. A free Indiana Artisan wine glass will be given out with every purchase! *If you are 16 years of age or under, we ask that you volunteer in tandem with a parent or adult. We strive to keep our volunteers safe and on task, and this is the best way to achieve our goal. To volunteer, please email mmcvicker@carmel.in.gov. Scroll through the content below for more information. If you wish to work closely with someone at this position, please know that the ID checker, arm bander, cash taker and glass distributor all work in the same area. So you if you sign-up for ID checker, for instance, your friend should sign-up for arm bander (or cash taker or glass distributor). If you wish to work closely with someone at this position, please know that the ID checker, arm bander, cash taker and glass distributor all work in the same area. So you if you sign-up for arm bander, for instance, your friend should sign-up for ID checker (or cash taker or glass distributor). If you wish to work closely with someone at this position, please know that the ID checker, arm bander, cash taker and glass distributor all work in the same area. So you if you sign-up for glass distributor, for instance, your friend should sign-up for ID checker (or cash taker or arm bander). You will exchange vouchers that have been purchased and distributed by the event’s key partners and sponsors. Voucher holders may also have a guest with them who does not have a voucher and you may have to check their guest’s ID and exchange their guest’s cash/credit cards for a sample wine glass. “Hurry up and wait.” We know volunteers like to stay busy. Please know that the value of a runner to event staff is to be willing to be at our event headquarters and complete a designated task at any given moment. This means you may have down time. Please know that your down time is of great value to us! Events have many unexpected needs and we appreciate your willingness to be on hand and answer the call when it comes in! While we do not encourage it, this is our only position that does not require a positive and excited attitude! Be sure to check www.CarmelLink.com for road construction projects and other detours in the area. 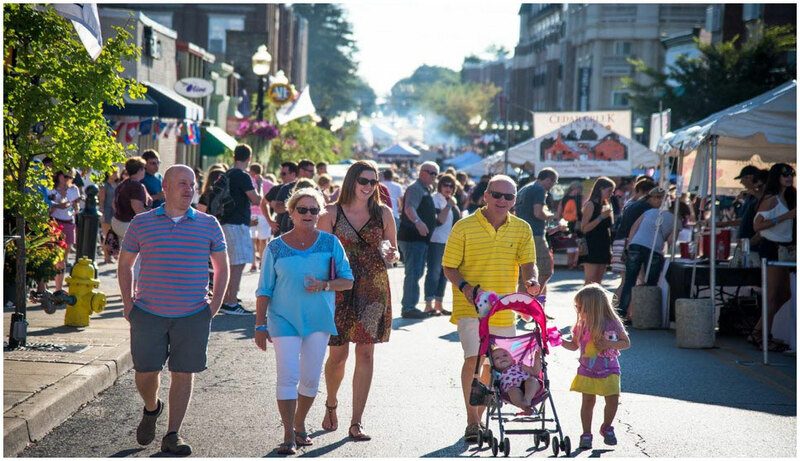 A complimentary trolley will be provided for patrons to the Arts & Design District from Carmel High School beginning at 5:00 p.m.
Public parking is available in any available street parking spots surrounding the festival area. More public parking is available in the Indiana Design Center underground parking garage located at 200 S. Range Line Road, Sophia Square’s underground parking garage at the southwest corner of 1st St. NW and 1st AV NW and at the Carmel Lions Club lot located at 141 East Main St.
Visit any of the District’s galleries. Click here for a complete list of our galleries. 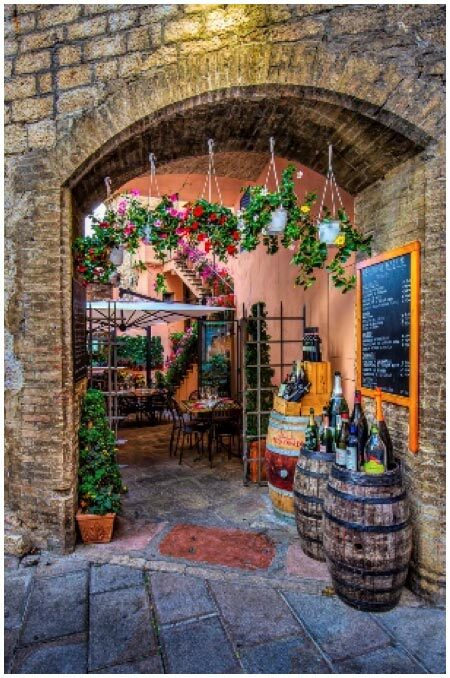 Indiana Artisan will have consigned piece by Ken Rabber called "Wine Shop - Assisi, Italy" available for purchase. Lynne Medsker will be painting names on visitor’s wine tasting glasses. Stop by the Indiana Artisan to get your tasting glass personalized. 1. 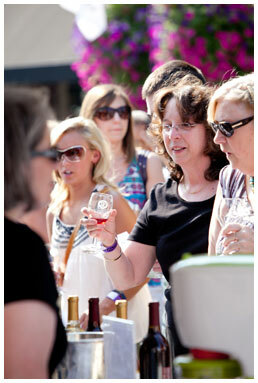 This is our 10th annual IU Health North Hospital Art of Wine! 2. You DO NOT need to purchase a tasting glass to enjoy the wineries. If your favorite winery is at our festival, you might be able to go directly to that winery. Most wineries (with the proper licensure) will be selling wine by the bottle or glass. 3. There are wonderful food and beverage options to choose from. Click Here. 4. You do not have to be 21 to enjoy the festival. You do have to provide identification if you choose to purchase a wine tasting glass or buy any alcohol. 5. Rain or shine the festival still goes on! 6. Look for the water station located on North Range Line Road for complimentary bottled water for our guests. 7. We are proud to have IU Health North Hospital as a partner, but please note the event is in the Carmel Arts and Design District, not the hospital. 8. There will be many photo opportunities throughout the festival. Peace Water Wine will have their signature VW bus, “Reggie” out. You will also find a number of Carmel Arts and Design District’s statues like the police officer at the intersection of Main Street and the Monon. 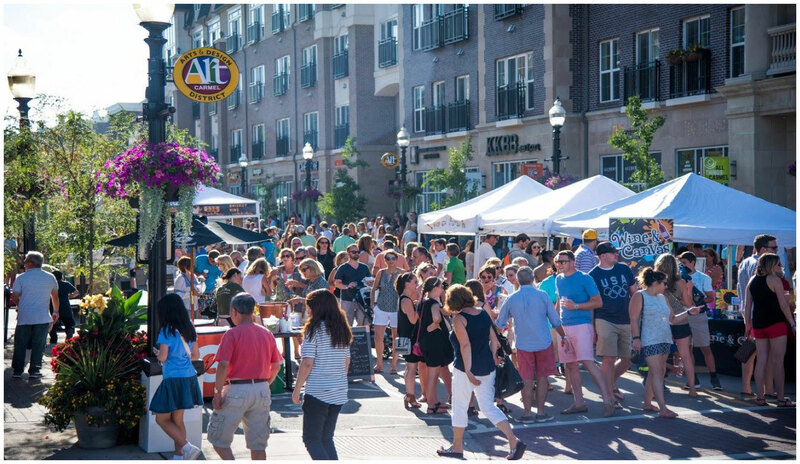 Be sure to tag @carmelartdesign on Instagram! 9. We are a destination event! In its ten year history we’ve welcomed guests from Canada to California. 10. Please drink responsibly. We will have designated locations for Uber and Lyft immediately outside of the festival footprint. Click here to experience the 2009 event! Click here to experience the 2010 event! Click here to experience the 2011 event! Click here to experience the 2012 event! Click here to experience the 2013 event! Click here to experience the 2014 event! Click here to experience the 2015 event! Click here to experience the 2016 event! Click here to experience the 2017 event!